This month’s issue focuses on Science for English Language Learners. This content area can present specific challenges, but it can also be a great learning experience because of all the opportunities to create hands on activities that foster content knowledge and language acquisition. TeachingChannel.org has a great clip on how to support ELLs through projects. Click on the photo to view. On Sunday January 3, 2016 Hackett Middle School in Albany, NY was host to the Karen refugee community as they celebrated one of the most important days on their calendar. The Karen (pronounced, kahr-EHN) are an ethnic group from the mountainous regions of Thailand and Myanmar, formerly Burma. Karen New Year is traditionally celebrated on the first day of the month of Pyathoe, signaling the end of the rice harvest. 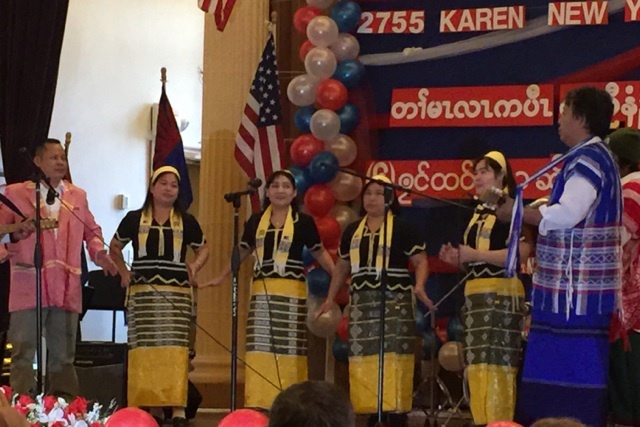 This was the sixth Karen New Year celebration held by the Karen community in Albany and the first time it was hosted by the City School District of Albany. It was a huge success as evidenced by the 800 people who attended, and the warmth and appreciation which reverberated in the halls of Hackett Middle School. The day included opening remarks by Karen elders, a welcome by Albany Mayor Kathy Sheehan, remarks from Albany Police Chief Brendan Cox and was presented by Tom Giglio, Director of ENL and Refugee Services and Lily Htoo, Home School Coordinator for the district who also served as event translator. The celebration included traditional and contemporary music and dance, a Karen lunch, and artifacts which were available for purchase. As these newcomers work to re – establish their lives in their new city, the school, their school, plays a pivotal role in their lives. To be part of the process of bridging the gap between their previous and new experiences is an awesome and complex responsibility. Part of this responsibility is to help newcomers keep their stories and their traditions whole as they transition to new lives. Hackett Middle School did just that on January 3! Click here to read the full article from Colorín Colorado. Our topic will be Assessment and Evaluation of ELLs. You can post questions, seek technical assistance or share resources that you may have found useful in working with English Language Learners. Sign up today! The Capital District RBERN would like to invite you to the third Focus Group of the year on February 3, 2016. Senior School Improvement Specialist Jane King will be presenting on the Next Generation Science Standards for grades 3-8 and how to apply them for English Language Learners. Click here for registration information. This conference will delve into the different methods that can be used to create assessments and evaluations for English Language Learners and how to use them to effectively assess your students to inform instruction. We will consider effective benchmark assessments, how to differentiate evaluations, and how to ensure your students are making progress at all proficiency levels. This event will be held at the Questar III Conference Center, 10 Empire State Boulevard, Castleton, NY 12033. Click here for registration information. The 2016 NYSESLAT Training of the Trainers will be held over a two day period. This training will provide an overview of changes for the 2016 NYSESLAT, a thorough understanding of the scoring rubrics, information on administering the NYSESLAT, and practice scoring for the Speaking and Writing sections. Click here for registration information. Bilingual Education Program Announcement of Funding Opportunity - The New York State Education Department (NYSED) and Office of Bilingual Education and World Languages (OBEWL), is seeking applications from Public School Districts for a Bilingual Education Program (transitional bilingual and one-way and two-way dual language) that provides English Language Learners (ELLs) with home language instruction as well as English/English as a New Language instruction. NYSED and OBEWL, in collaboration with the City College of New York and Understanding Language Initiative at the Stanford Graduate School of Education, announce the second year of the New York ELL Leadership Institute. February 11 – 13, 2016 – Northeast Conference on the Teaching of Foreign Languages (NECTFL) Conference in New York City. Click here for more information. NECTFL Scholarships Available! – Do you want to attend the NECTFL conference in February? There are scholarships available for new and mentor teachers. Click here for more information. June 6, 2016 – July 29, 2016 – 2016 Summer Internship Program in Washington, D.C. This opportunity is for former Migrant and Seasonal Head Start students currently enrolled in college. Applications due February 26, 2016. Click here for more information. Local Albany Students win a trip to the Grammys – Two Albany middle school students won the sixth annual Grammy Foundation and MusiCares Teens Make Music Contest. They submitted an original song about resisting drugs, alcohol and other negative influences. Click here to read the article. Carey Gabay Memorial Scholarship – Student who are incoming freshman at a State University of New York school are encouraged to apply for this scholarship. Applications are due March 15th. Click here for more information. Questar III Adult Education Programs – Questar III BOCES is offering High School Equivalency Preparation classes and Adult ENL classes. Click here for more information for Rensselaer County and click here for more information for Columbia and Greene Counties. You can also click here to find more information on their website. Science for Every Child Scholarships – Thanks to SUNY Poly Children's Museum of Science and Technology parterns, SUNY Poly CMOST is offering scholarships for group visit admissions for February and March for children in grades Pre K–6. Click here for more information. Looking to volunteer? Literacy Volunteers of Rensselaer County invites you to participate in Power Lunch at a School in Albany, Cohoes, East Greenbush or Troy. For more information click here. Colorín Colorado has updated their website! Check it out here. Teachingchannel.org has an extensive library of videos to help teachers on a variety of topics.